Originally this home, built in 1971 on the golf course in Varsity Estates, was fabulous in it’s day with limestone fireplaces, mahogany cabinets, walnut paneling and crystal chandeliers. 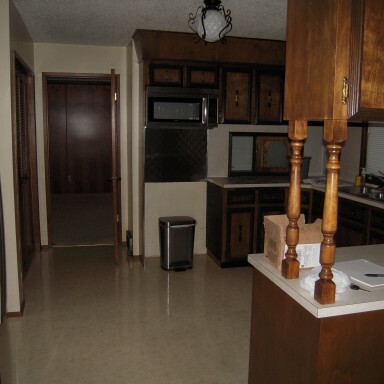 My clients purchased the home and gutted the main and second floors, we moved walls, created a master suite and opened up the main floor (see the before of the kitchen). 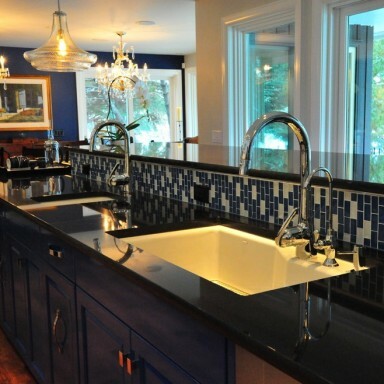 The design direction was defined by the contemporary concept of white sinks graphically positioned against black counter-tops and a love of blue. The once closed, small kitchen now opens onto the back yard patio and golf course with expansive full glass doors. We salvaged the beautiful limestone fireplaces, cleaned, re-wired and re-installed the crystal chandeliers. We optimized storage with a tall wall triple pantry, an appliance garage and a huge island. The home owners selected energy efficient, modern appliances in stainless steel. A functional work, cook and dine space was created in this small, dark enclosed kitchen when walls were opened and expansive glass doors were installed onto the back yard patio. 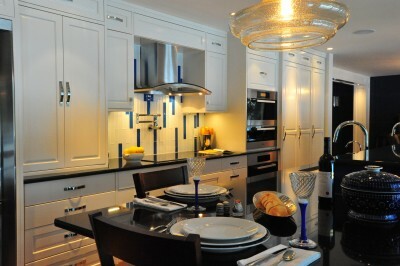 The white, lacquered tall wall houses custom cabinets, a Miele hood fan, double ovens and steam oven. 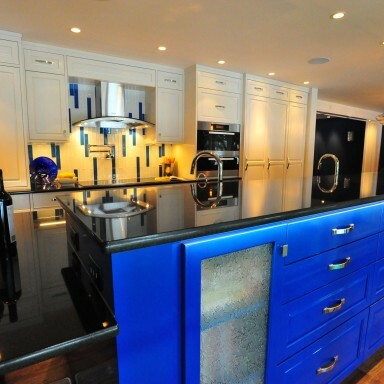 Blue and white custom designed glass black-splash has been installed vertically. The lacquered, white, tall wall houses double fridges, a triple pantry, appliance garage, double ovens and the cook zone. Casual dining for four to six punctuates one end of the expansive seventeen-foot gloss, electric blue island. The granite dining area doubles as a great bar and buffet space for larger parties. Prep and clean-up zone with expansive counter tops, a white large single basin porcelain sink and prep sink look onto the backyard patio and golf course. Sleek black granite contrasts the white sinks creating a contemporary attitude. 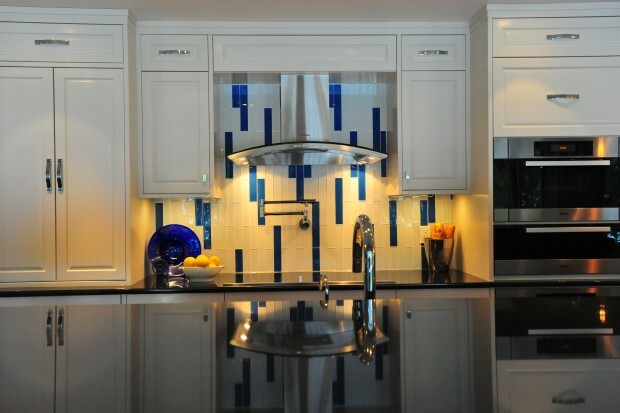 The graphic custom designed blue and white glass tile back-splash ties the gloss, electric blue island. A white tall wall of custom cabinets and pantries is a great backdrop to seventeen-feet of electric blue, gloss island storage. 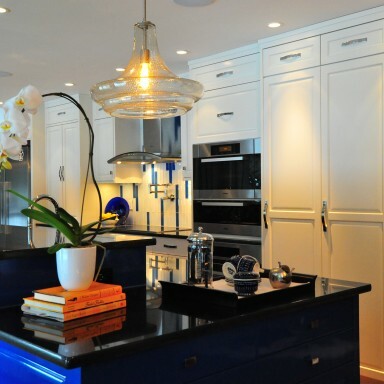 The island with custom designed cookbook and drawer storage is capped with black gloss granite. Channel lighting installed into the granite washes the island and chrome hardware with light. The white tall wall with maximized storage in three pantries and appliance garage flanks a Miele cook top and hood fan. Defining this space is a seventeen-foot electric blue, gloss island is punctuated by a server with storage drawers that opens onto the dining room. Before Picture. A spectacular change was made by opening up this kitchen and opening the home up to the beautiful backyard and renovating the expansive, two storey space.